19.05.2017, Nicosia – Within the framework of The Council of Europe ministerial meeting Georgian Foreign Minister Mikheil Janelidze presented instruments of ratification of the Istanbul Convention to the Deputy Secretary General of the Council of Europe Gabriella Battaini-Dragoni. Georgia acceded in 2014 to the Istanbul Convention on preventing and combating violence against women and domestic violence. Istanbul Convention ratification package was adopted by the Parliament of Georgia in May of 2017. 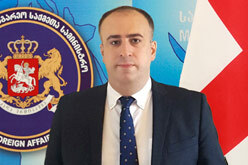 Based on the requirements of the Convention, amendments were made to the laws of Georgia, as well as to the Criminal Code of Georgia in order to bring the Georgian legislation into compliance with Convention standards. The ratification of the Convention indicates clearly that Georgia attaches paramount importance to the upholding of such values as human rights, the rule of law and democracy.